The purple striped jellyfish has a distinct bell that is white with purple stripes that spoke outwards form it's center. The bell of the purple striped jellyfish averages 0.7m in diameter. They possess four long, white oral arms that flank the mouth. Additionally, the purple striped jellyfish has eight white tentacles with stinging nematocyst cells that aide in prey capture. They generally move passively but can swim slowly through the water by contracting their bell. The diet of the purple striped jellyfish consists of zooplankton, other jellyfish, salps and fish eggs. 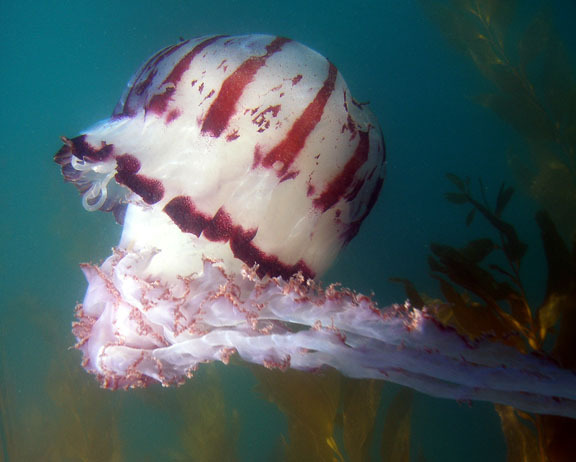 The purple striped jellyfish is common off the coasts of California in the Pacific Ocean. They are commonly seen near the surface in large groups. Purple striped jellyfish are capable of delivering a powerful sting to humans that come into contact with its tentacles. Stings are rarely fatal. "Chrysaora colorata". Animals Wiki. Retrieved from: http://animals.wikia.com/wiki/Chrysaora_colorata.